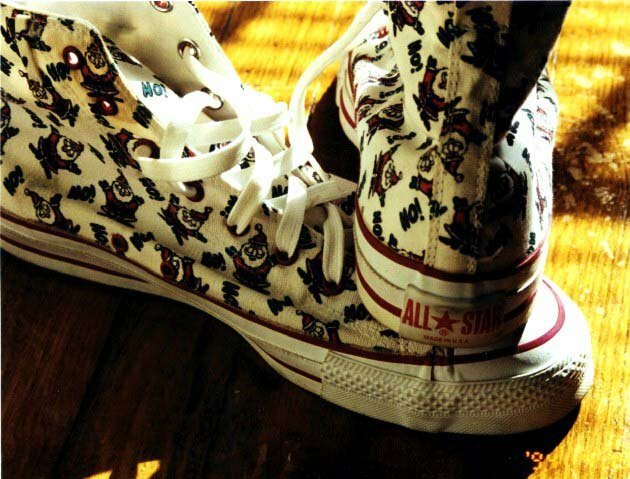 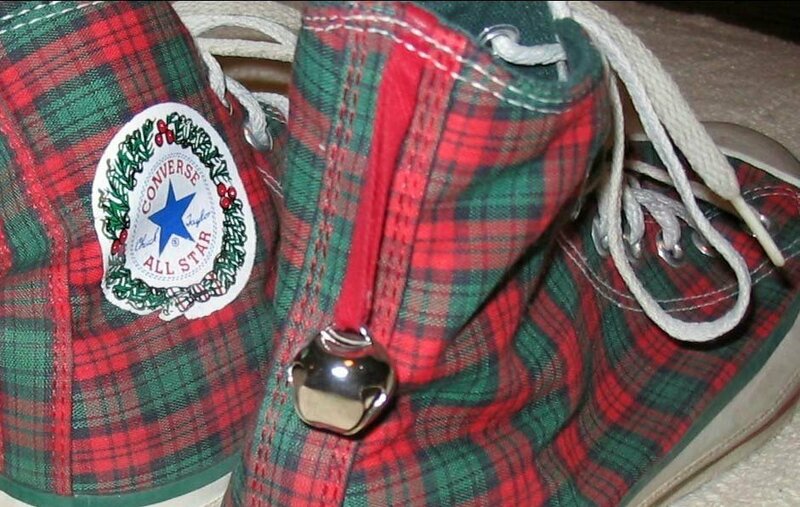 Photo gallery of Christmas season high top chucks. 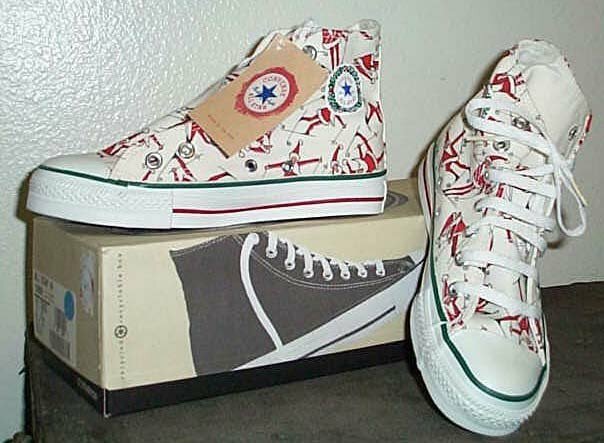 1 Christmas High Top Chucks Inside patch view of a left holiday pattern and red satin 2-tone high top. 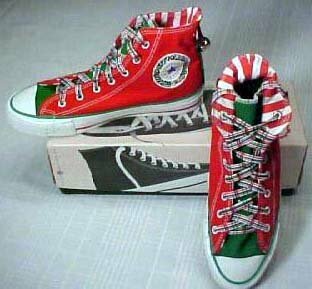 2 Christmas High Top Chucks Outside view of a left holiday pattern and red satin 2-tone high top. 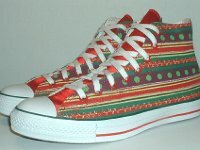 3 Christmas High Top Chucks Inside patch view of a right holiday pattern and red satin 2-tone high top. 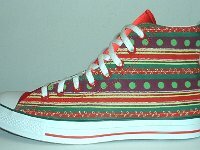 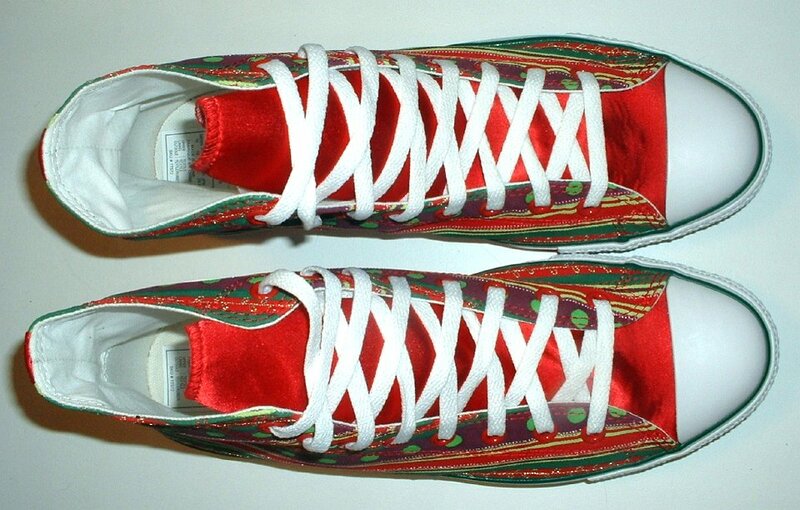 4 Christmas High Top Chucks Outside view of a right holiday pattern and red satin 2-tone high top. 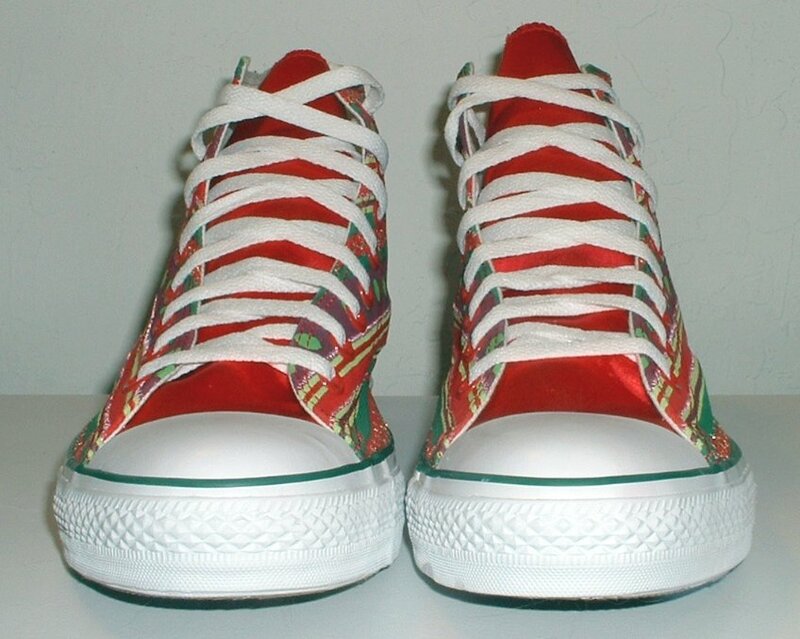 5 Christmas High Top Chucks Rear view of holiday pattern and red satin 2-tone high tops. 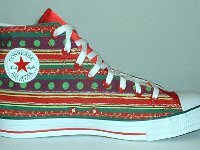 6 Christmas High Top Chucks Front view of holiday pattern and red satin 2-tone high tops. 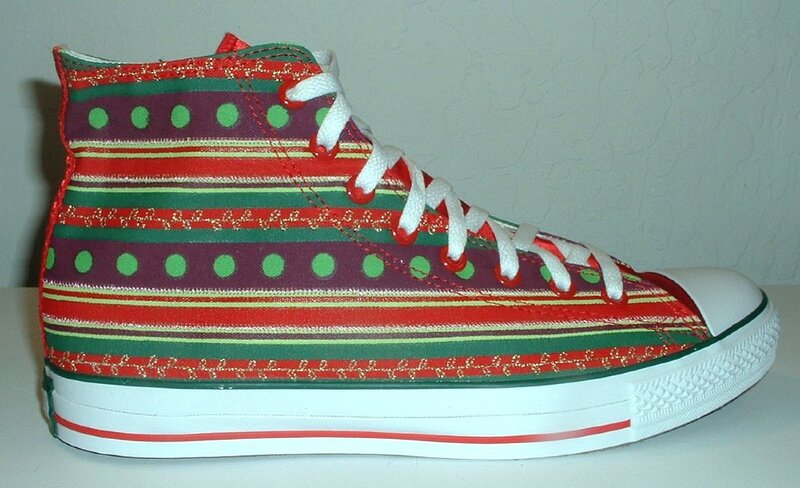 7 Christmas High Top Chucks Angled front views of holiday pattern and red satin 2-tone high tops. 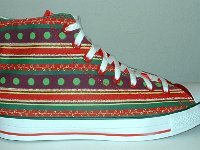 8 Christmas High Top Chucks Top view of holiday pattern and red satin 2-tone high tops. 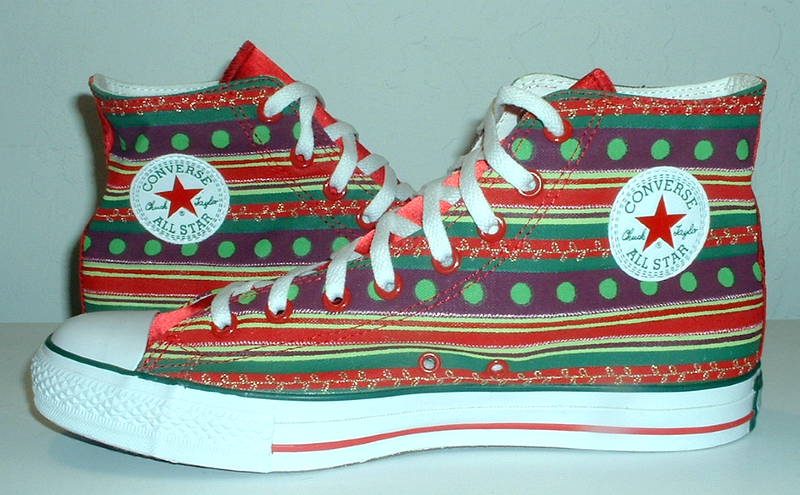 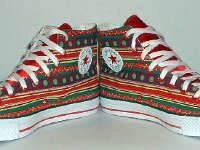 9 Christmas High Top Chucks Inside patch viewa of holiday pattern and red satin 2-tone high tops. 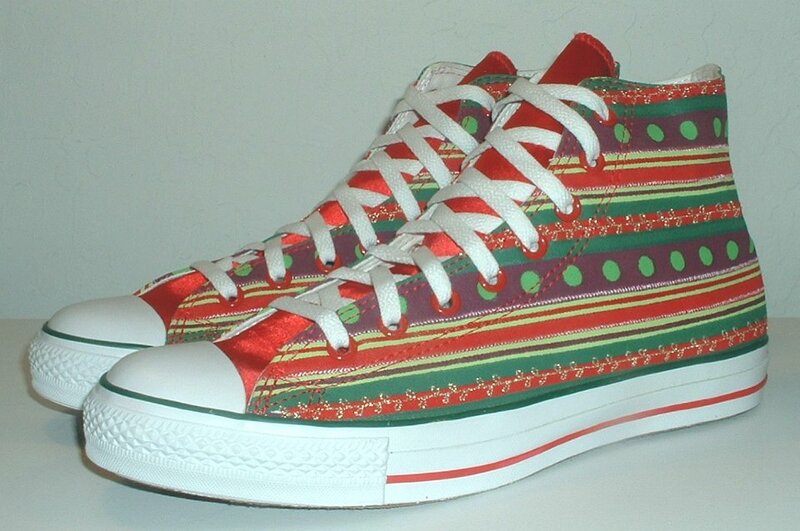 10 Christmas High Top Chucks Angled side view of holiday pattern and red satin 2-tone high tops. 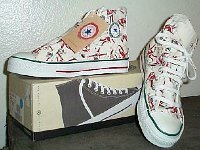 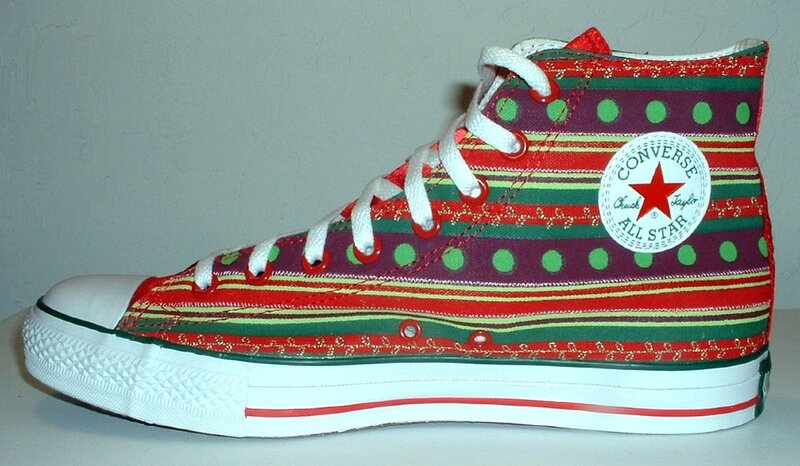 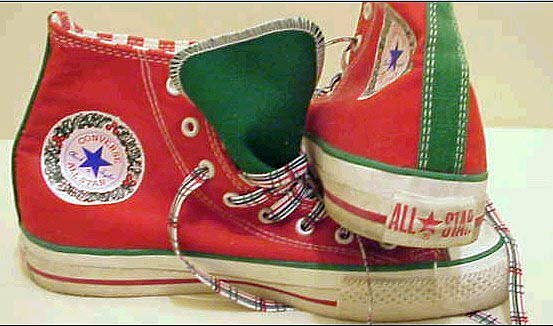 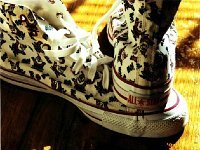 11 Christmas High Top Chucks Inside patch and sole views of holiday pattern and red satin 2-tone high tops. 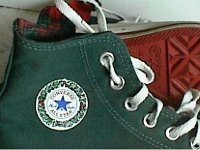 12 Christmas High Top Chucks Close up of the patch and sole of green and red 2 tone high tops. 13 Christmas High Top Chucks Side view of green and red 2 tone showing bell, red side strip, bell, and plaid interior. 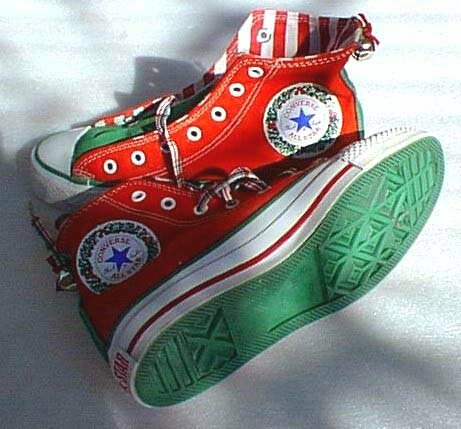 14 Christmas High Top Chucks Rear view of green and red Christmas 2 tone high tops. 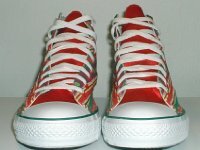 15 Christmas High Top Chucks Front view of green and red 2 tone Christmas high tops. 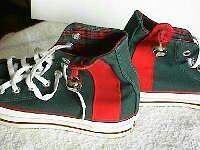 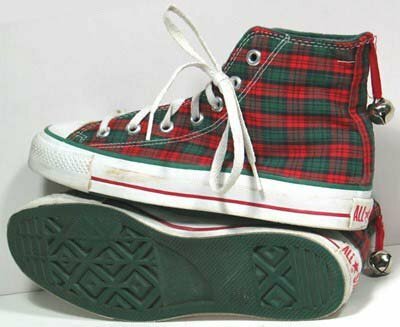 16 Christmas High Top Chucks Angled side view of green and red 2 tone high tops showing the inside patch and plaid interior. 18 Christmas High Top Chucks Side and sole view of green and red Christmas 2 tone high tops. 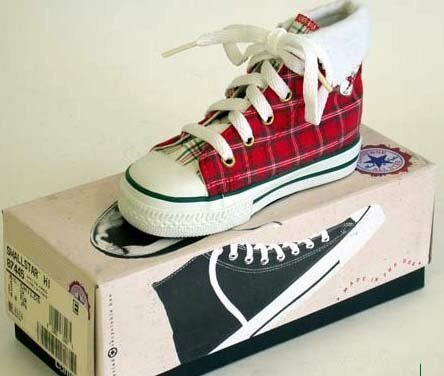 19 Christmas High Top Chucks Plaid Christmas high tops for infants and toddlers, angled front and sole view. 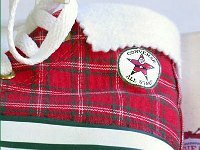 20 Christmas High Top Chucks Close up of the inside patch for plaid infant/toddler high top chucks. 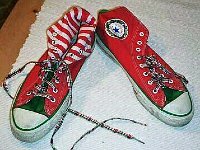 Santa is an All Star. 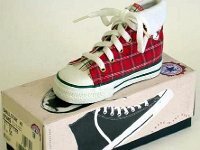 21 Christmas High Top Chucks Plaid Christmas high top chucks for infants/toddlers, angled side view. 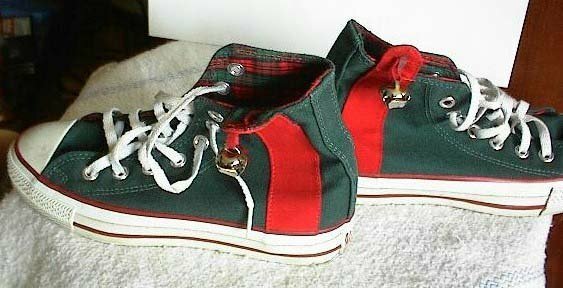 22 Christmas High Top Chucks Plaid Christmas high tops, left outside and sole views. 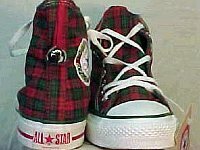 23 Christmas High Top Chucks Plaid Christmas high tops, front and inside left views. 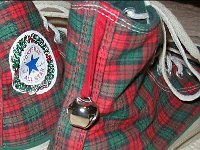 24 Christmas High Top Chucks Closeup of the Converse holiday patch and jingle bell on a pair of plaid Christmas high tops. 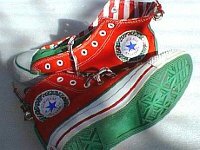 25 Christmas High Top Chucks Closeup of the toecaps of a pair of Christmas high tops, showing the green and red piping. 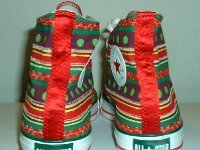 26 Christmas High Top Chucks Inside patch view of a pair of Christmas high tops. 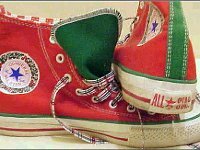 27 Christmas High Top Chucks Rear view of a pair of Christmas high tops showing the jingle bells and red all star heel patches. 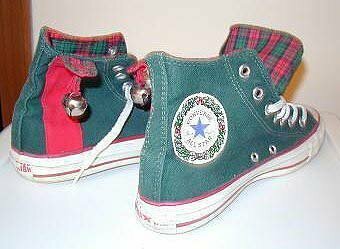 28 Christmas High Top Chucks Plaid Christmas high tops, left inside patch and sole views. 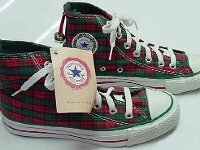 29 Christmas High Top Chucks Brand new pair of plaid Christmas high tops, side view. 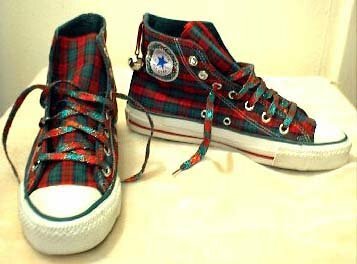 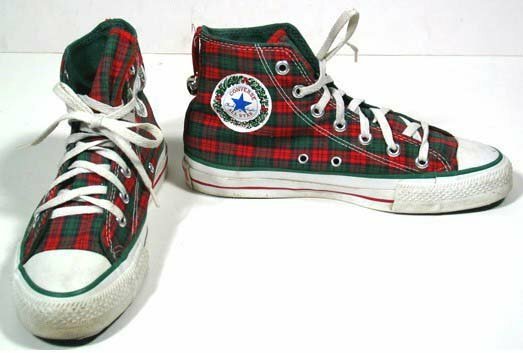 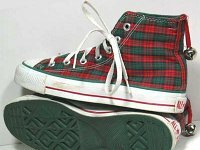 30 Christmas High Top Chucks Plaid Christmas high tops with holiday laces. 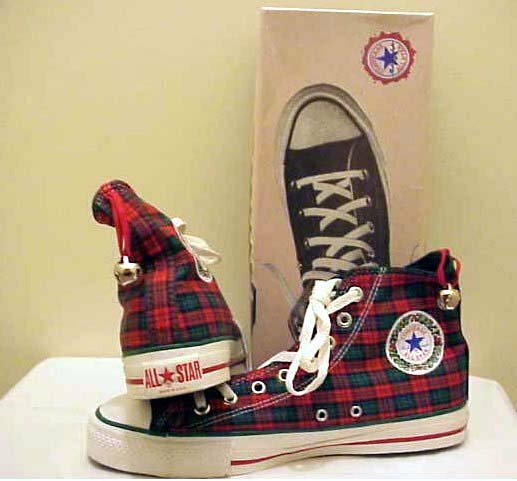 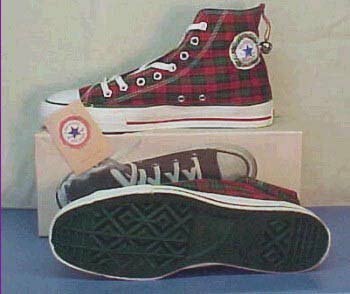 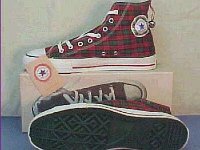 31 Christmas High Top Chucks Brad new plaid Christmas high top chucks with box, right inside patch and left sole views. 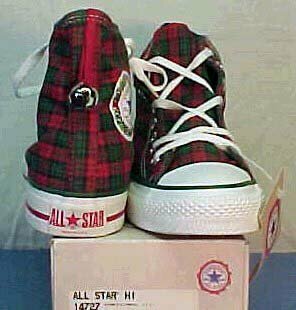 32 Christmas High Top Chucks Brand new plaid Christmas high tops on their box, showing front and rear of the shoes. 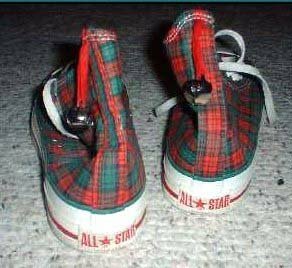 33 Christmas High Top Chucks Brand new plaid Christmas high tops, showing the right inside patch and rear heel patch and jingle bell. 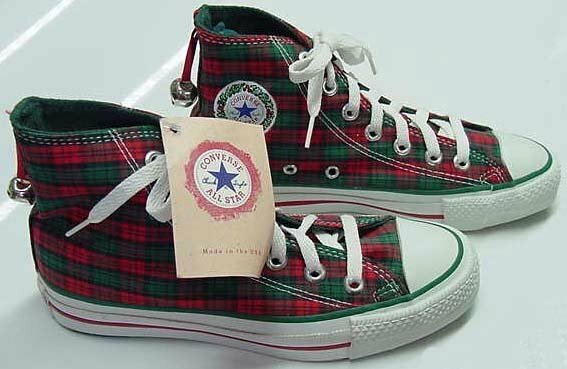 34 Christmas High Top Chucks Plaid Christmas high top chucks, showing the heel patch and special Converse side patch. 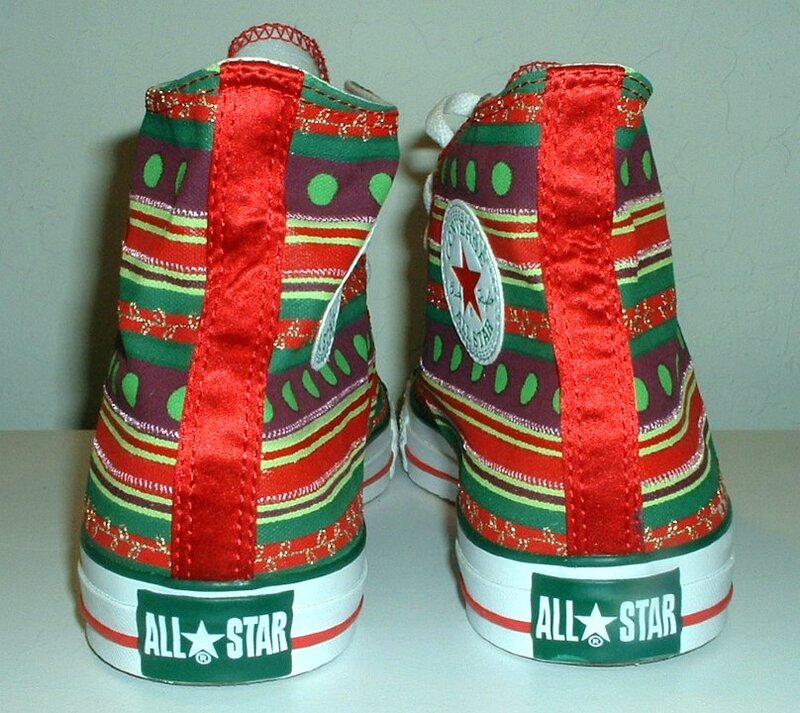 35 Christmas High Top Chucks Red and green 2 tone high tops showing the inside candy cane lining. 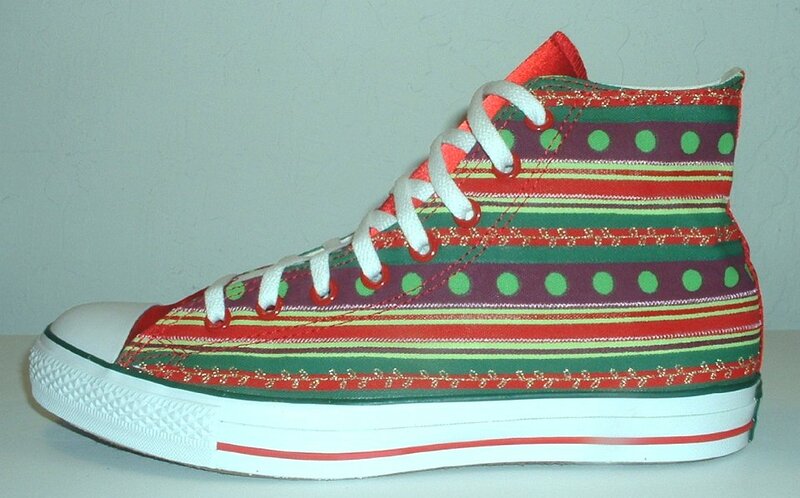 36 Christmas High Top Chucks Red and green 2 tone Christmas high tops, showing the right inside patch and green sole. 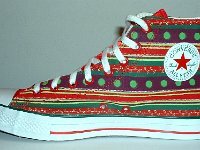 37 Christmas High Top Chucks Red and green 2 tone Christmas high tops, angled top view. 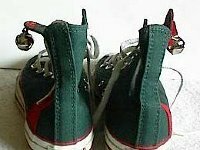 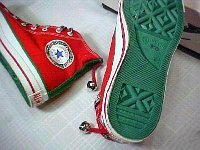 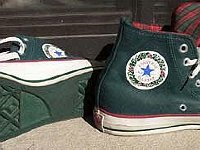 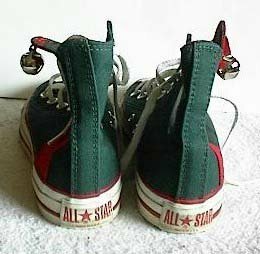 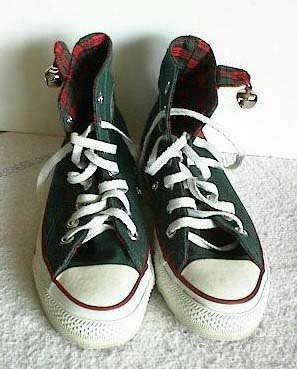 38 Christmas High Top Chucks Worn red and green 2 tone high tops, left inside and rear views. 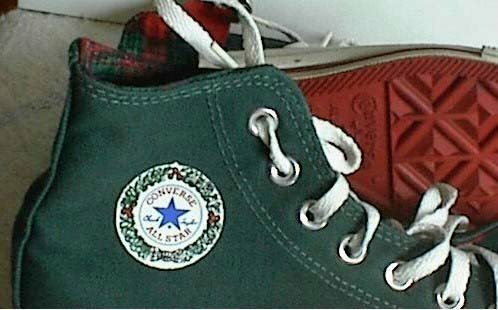 39 Christmas High Top Chucks Brand new red and green 2 tone Christmas high tops, showing the green sole and Converse Christmas patches. 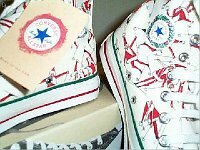 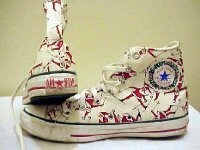 40 Christmas High Top Chucks Santa "ho ho" print white high tops, side and rear views. 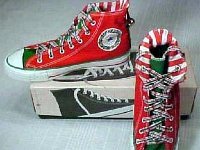 41 Christmas High Top Chucks Brand new "Santa skiing" Christmas high tops, side and angled front views. 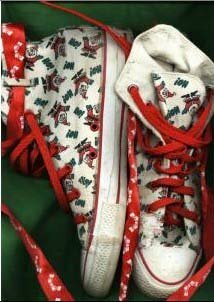 42 Christmas High Top Chucks Close up of the "Santa skiing" print. 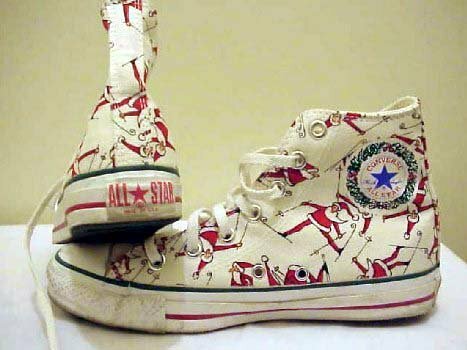 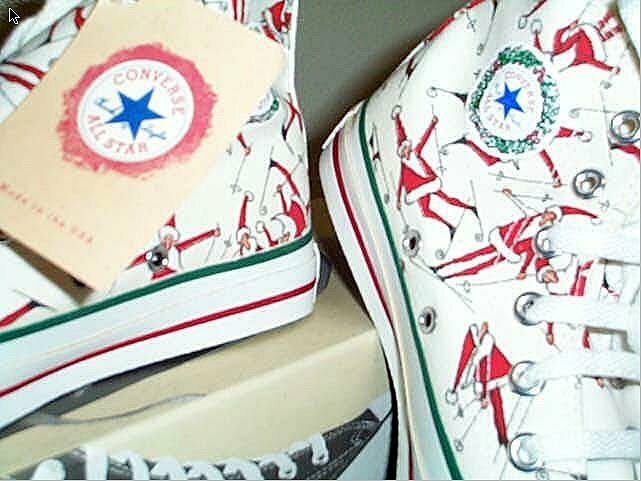 43 Christmas High Top Chucks White "Santa skiing" high tops, showing inside right and rear heel patch views. 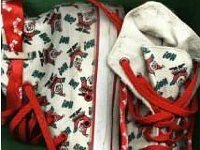 44 Christmas High Top Chucks White "ho ho" Santa high tops, with red holiday laces and custom loops. 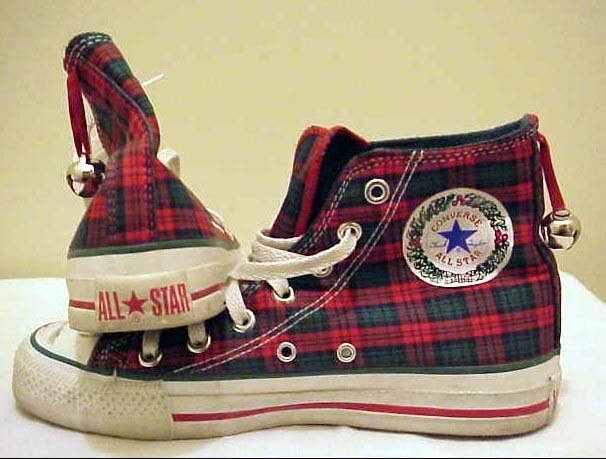 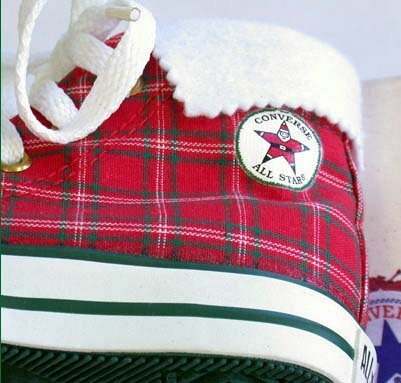 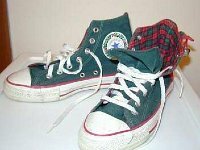 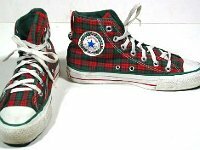 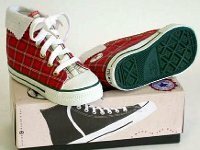 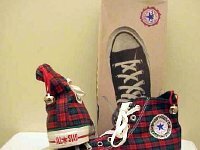 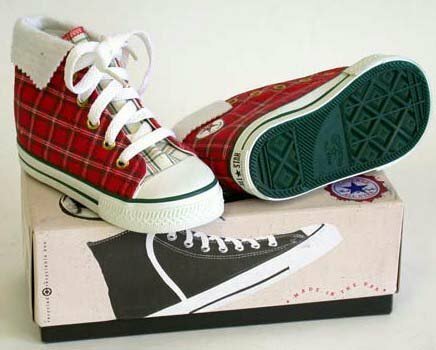 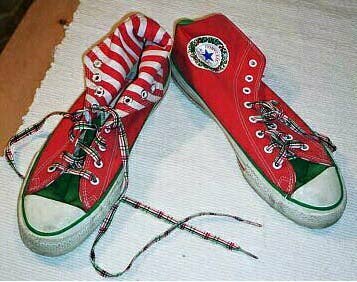 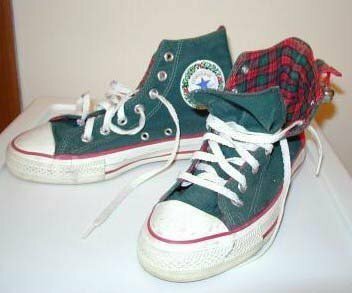 For many years, the Converse Company has produced special versions of Chuck Taylors for the Christmas holiday season. 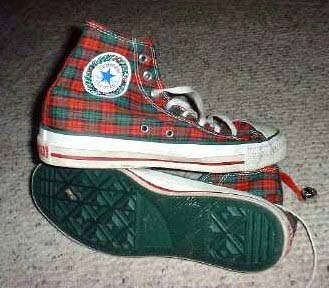 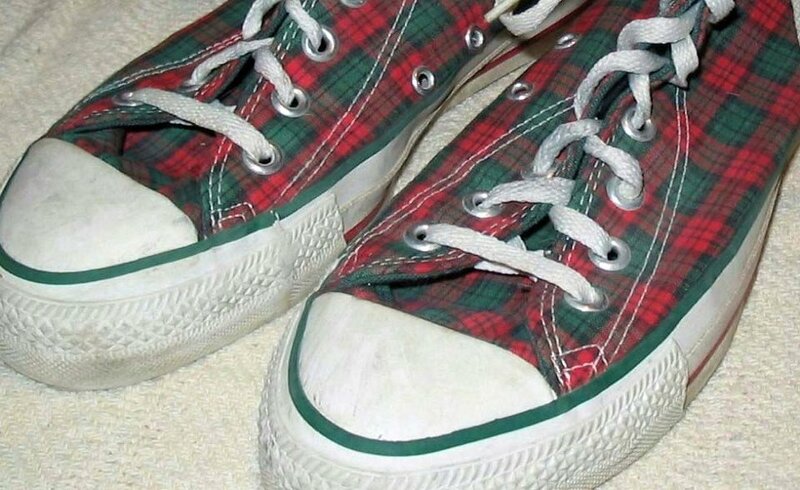 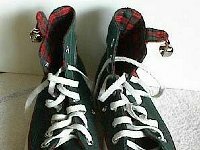 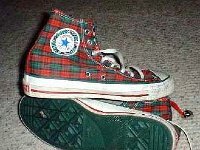 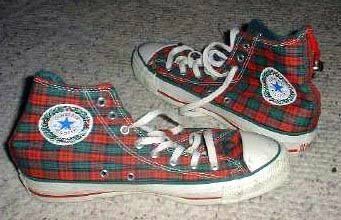 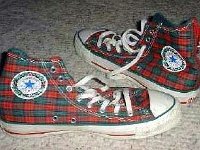 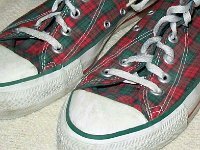 The shoes are usually red and green, and are either plaid fabric or two color. 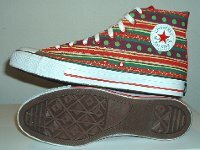 The company has also made pairs with different Santa Claus patterns. 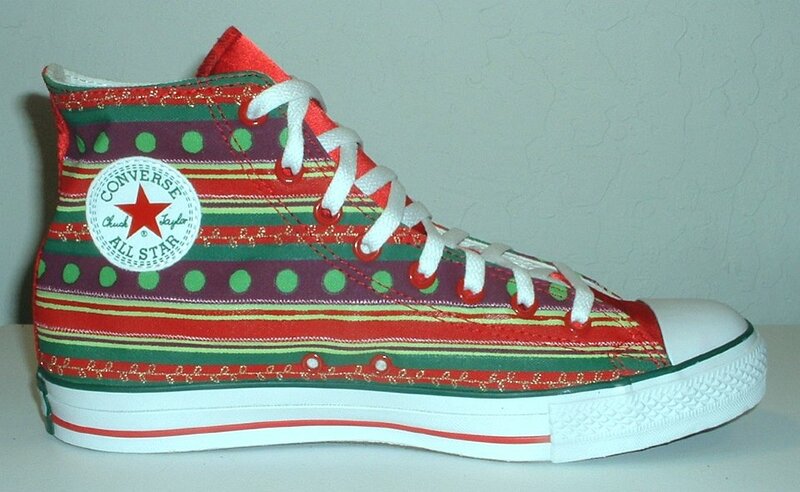 Christmas Chucks feature a special All Star side patch with a red and green wreath instead of the dotted line border. 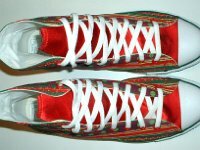 The rubber piping around the white outsoles is a combination of red and green, with a red All Star label on the back. 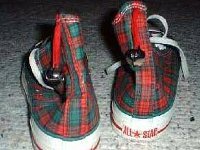 The plaid fabric models also have attached jingle bells. 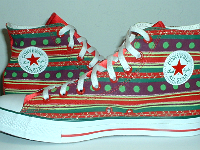 The latest models have been more generic, with candy cane and wrapping paper patterns.